Halloween is celebrated in the United States on October 31. The name “Halloween” comes from “All Hallows Eve,” or the day before All Saints Day, a traditional holy day for Christians. Halloween originated in Europe but during the 19th century immigrants brought it to North America, where it spread in popularity and evolved in many ways. According to tradition, the spirits of the dead were able to come back to life to harm people and crops in the physical world. People tried to appease the restless spirits on Halloween, and these practices led to many of today's Halloween traditions. For example, people used to wear costumes of monsters, ghosts, and devils to scare away the harmful spirits. Is Halloween Celebrated Only in America? People still celebrate by wearing scary costumes. However, today they also dress up like popular celebrities, children's show characters, princesses, super heroes and much more. 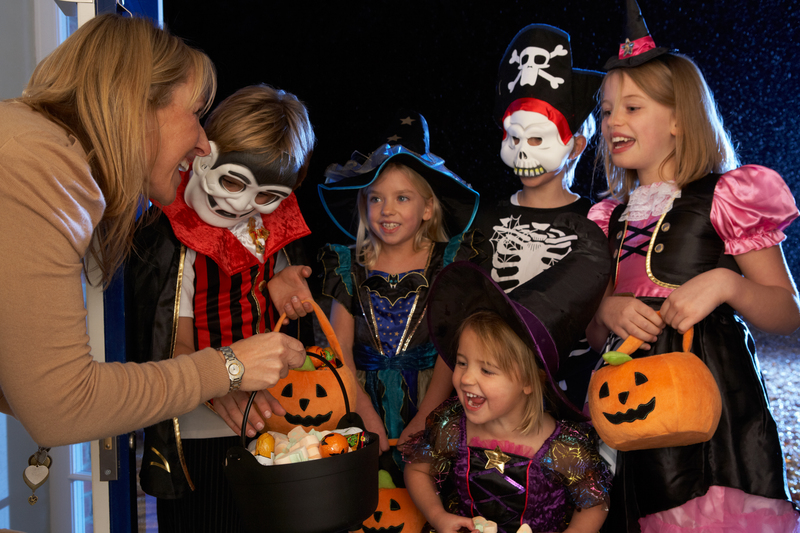 After dressing up, kids go trick-or-treating. They go from house to house in their neighborhoods and ask for treats such as candies and snacks by saying, “Trick or treat!” According to tradition, if no treat is given, they can play a trick on the homeowners. The traditional scary and modern fun sides of Halloween are seen today as the Jack-o'-lanterns that people create by carving scary faces on pumpkins. Homeowners place Jack-o'-lanterns in front of their houses to scare evil spirits and to welcome trick-or-treaters. Other modern fun activities that reflect the traditional past of Halloween include watching horror movies and visiting haunted houses. The celebration in the United States has spread to other countries throughout the world as a fun and commercial event. Today many people celebrate Halloween with costumes and candy, without knowing the history of the traditions. In addition, some organizations including UNICEF use the same concept of trick-or-treat to ask for money for fund raising to be used to help people in need around world. For more information about Halloween, visit the following publication: Celebrate! See the chapter on Halloween. Pumpkin carving is a big part of Halloween celebrations in the United States. During this activity, your students will draw a Jack-o'-lantern. 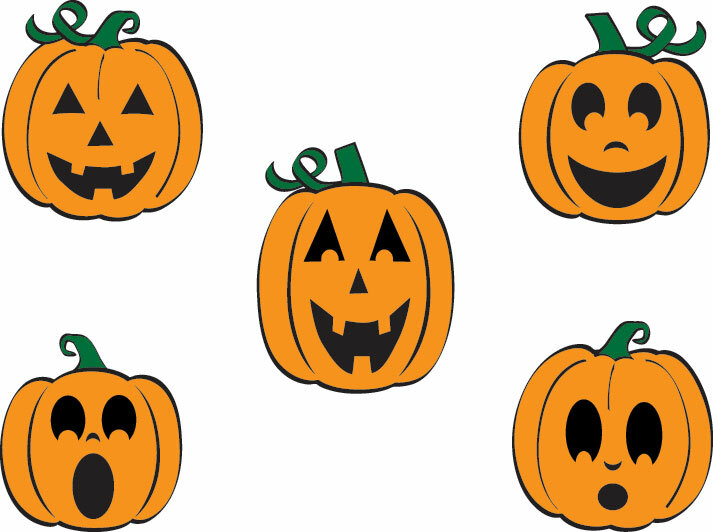 Prior to class, go online and find a few examples of Jack-o'-lantern faces. Or you can use the examples provided below. Give a general description: This jack-o-lantern has two eyes, a nose, and a mouth and it looks happy. Draw two triangles for eyes near the top of the pumpkin. Draw one triangle for a nose under the eyes and in the middle of the face. Draw a half circle for a mouth under the nose. Make it wide to look like an open-mouth smile. Add three teeth to the smile, one that sticks up from the bottom of the mouth in the middle (It looks like a small rectangle) and two that hang from the top of the mouth on either side of the bottom tooth. Other useful expressions: to the left of, to the right of, next to, close to, above, in the center. After each pair of students has completed two drawings, have them compare their drawings to the originals. To celebrate Halloween, they can post their drawings on the wall of the classroom or create brand new Jack-o'-lanterns to share. As Halloween is one of the most widely celebrated days in the United States, there are many relevant songs and poems for the holiday. In this activity, your students will be writing an “acrostic” poem about Halloween. An acrostic poem has a distinctive format where the combination of the first letters of each line comes from a certain word or phrase. The content of the poem is also related to the resulting word or phrase. First, tell your students that they are going to write an acrostic poem and explain what it is. To help their understanding, introduce the following poem as an example. Tonight at last is Halloween. Remember your costume If you forget you can't go out. Children visiting neighbors' doors asking for candy like, Kit Kat candy bars. Tricky goblins may be behind walls, Rickety old houses, Elves with little hats, All wander the sidewalks because Tonight it is Halloween. Next, give your students some Halloween-related words so that they can use them in their poem (e.g., bonfire, costume, ghost, pumpkin, scary, skeleton, jack-o'-lantern, candy). You can use some words included in the Overview section. (If writing a full poem is too difficult for your students, they can simply write one word for each line.) Then, give them enough time to write their own poems on a piece of paper. Once they are done, ask them to display their poems on the wall of the classroom to share all of the poems with their classmates. Does your country celebrate Halloween or a similar holiday? If so, how have you celebrated this day? For Trick-or-Treat, some children ask for money instead of candy, to support organizations like UNICEF or the Juvenile Diabetes Research Foundation. What organization would you like to ask for money for?